To say that Myanmar loves Aung La N Sang is an understatement. Arguably the greatest martial artist to come out of the country, Aung La N Sang, the reigning ONE Middleweight and Light Heavyweight World Champion, always gets a massive ovation whenever he’s on a ONE card in Myanmar, and recently, the man known as “The Burmese Python” was given a tremendous honor. Aung La N Sang was honored with his very own bronze statue, which was unveiled at the Kachin National Manau Park in his hometown of Myitkyina. The statue shows Aung La N Sang with both world championship belts resting on his shoulders. 2018 has been nothing but an amazing year for the 33-year-old. Aung La N Sang began the year by becoming just the second athlete to ever win a world championship in two weight divisions in the history of ONE Championship, capturing the ONE Light Heavyweight World Championship by beating Alexandre Machado. After that, Aung La N Sang successfully defended his ONE Middleweight World Championship twice, defeating Ken Hasegawa and Mohammad Karaki, both via TKO. The cherry on top of his magnificent year was his Male Athlete of the Year win at the 2018 Global Martial Arts Awards which was held in Singapore back in November. Now, Aung La N Sang has a statue of his own. The Myanmar-born star however admitted to initially not being too comfortable with his image and likeness being immortalized in bronze. “I am just coming to the prime of my career and don’t want any more added pressure. 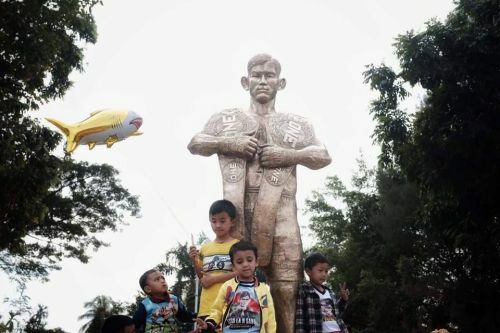 I was also worried about the hate that would come out of people who disagreed with building this statue,” Aung La N Sang bared on the ONE Championship website. He did warm up to the idea by thinking of it as a form of inspiration for the children in his hometown. “I know I have a lot of faults and may let many people down in the future. So don’t look up to me, just use me as an example that even from a very humble upbringing with hard work, grit, and God’s grace our hard work will be blessed,” Aung La N Sang concluded.